Zlatan Ibrahimovic's future at Manchester United is "up in the air" given his knee injury and contract situation, says Rene Meulensteen. Former Manchester United assistant manager Meulensteen believes if Ibrahimovic has a serious knee injury it won't help with negotiations over his future at Old Trafford. 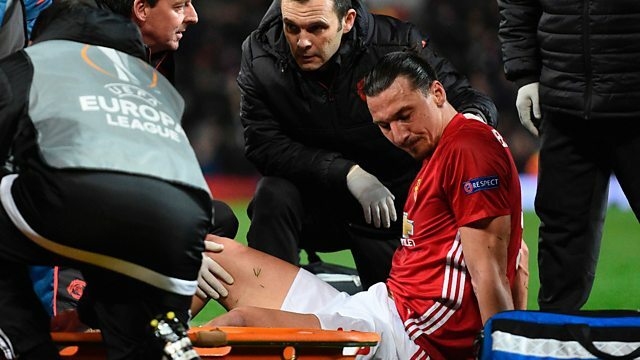 Ibrahimovic injured his knee in the club’s win over Anderlecht and is out of contract at the end of the season. United boss Jose Mourinho says early news on the injury is "fairly negative". Meulensteen added: "When you have players like Zlatan that score 28 goals, you have to consider who is going to replace those 28 goals." This clip is originally from 5 live Breakfast Friday 21 April 2017.